Background: The ability to kill lymphoid cells with a non-toxic prodrug/gene/ toxin system would be of value in the treatment of lymphoid malignancies and in the regulation of T cells used in adoptive immunotherapy. Objective: In this in vitro study we examined the ability of a novel prodrug/gene/toxin system to produce cytotoxicity in lymphoid cells. The system uses a non-toxic prodrug ethanol, human alcohol dehydrogenase and exerts the toxic action via the prolonged production of acetaldehyde produced within targeted cells. Methods: Raji B cells were transduced with an alcohol dehydrogenase containing lentivirus and then exposed to differing durations of daily ethanol exposure. Cell numbers and viability were assessed by trypan blue exclusion. Results: Individually, ethanol and the ADH gene were non-toxic to Raji B cells. 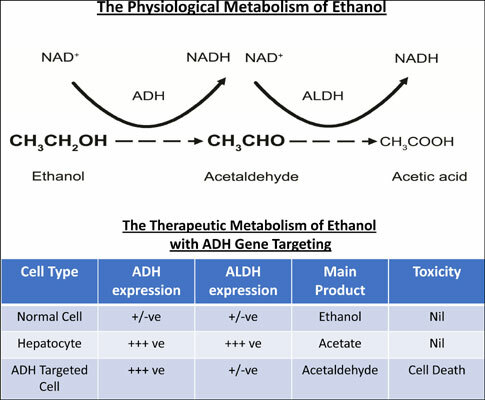 Exposure of ADH transduced cells to ethanol produced prompt growth inhibition and later cell killing that could be negated by the presence of 4-MP the alcohol dehydrogenase inhibitor. At 96 hours exposure to ethanol the number of ADH transduced cells had declined by up to 66% and their total number comprised only 2% of the proliferating untreated control cells. Conclusion: The ethanol ADH acetaldehyde system offers a simple, safe, non-toxic approach to cancer therapy prodrug toxin technology. It may also offer a safe and non-toxic system to control the number and action of T cells used in adoptive immunotherapy. G-DEPT, cancer, gene therapy, ethanol, acetaldehyde, T cells.